The construction of The Asian Library on the roof of the University Library is progressing steadily. The original row of merlons has been sawn off during the summer, the Asian Library’s roof is in place and the future conservatory for the Asian garden is taking shape. 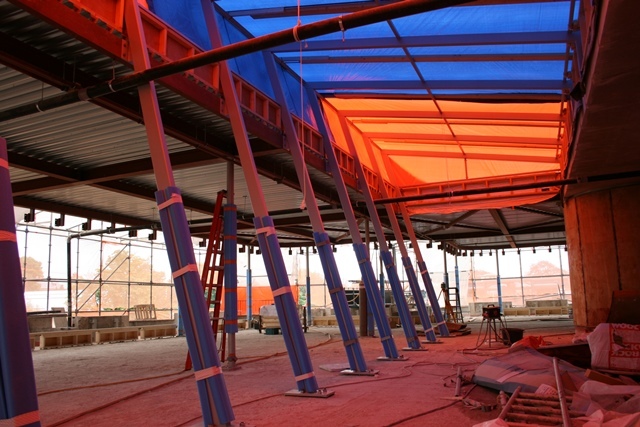 Right now, the frames that will hold the glass facades are being put in place. 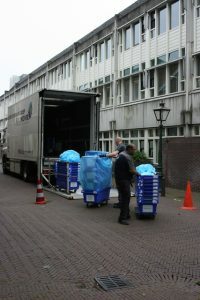 The KITLV reference library is moved from the open stacks on floor -1 to the Noordhal’s ground floor. 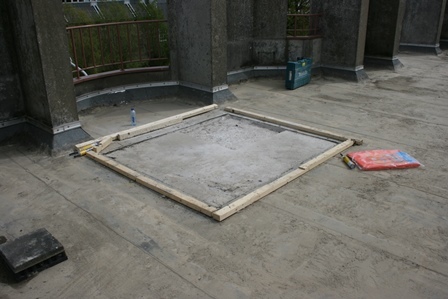 This measure is taken to create space for the material of the East Asian Library that is being brought in from the Arsenaal building for the Asian Library. The latter is scheduled to open in the spring of 2017. At this moment we are finalizing the relocation of the collections from the stacks of the East Asian Library (EAL) into the closed stacks of the University Library. A few exceptions aside, such as the reference collection, microfilms, and redundant collections, the complete EAL collections will be moved into the closed stacks of the University Library by the end of August. 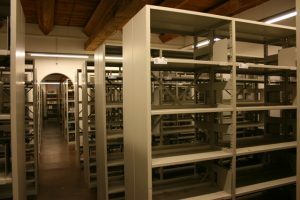 Between September 2016 and February 2017 a part of the collection (2.500 m) will be reshelved into the open stacks on the minus 1 level of the University Library. The collection will be placed according to the Library of Congress Classification. The reference collection will ultimately be housed in the newly-constructed Asian Library in April 2017. We will make sure all of the collections will remain available during these operations. After the move of the EAL collections into the University Library, the materials can easily be requested and delivered to the Arsenaal, the University Library, or any other library location. In the University Library the requested materials will be available within one hour and can be collected from the book lockers. Delivery to other library locations will be once a day. Due to the ongoing reshelving of the collections, there may be some delay in delivery times. At the Arsenaal the study area -including the reference collection, teacher shelves, and information desk- will remain available until the Asian Library opens in April 2017. 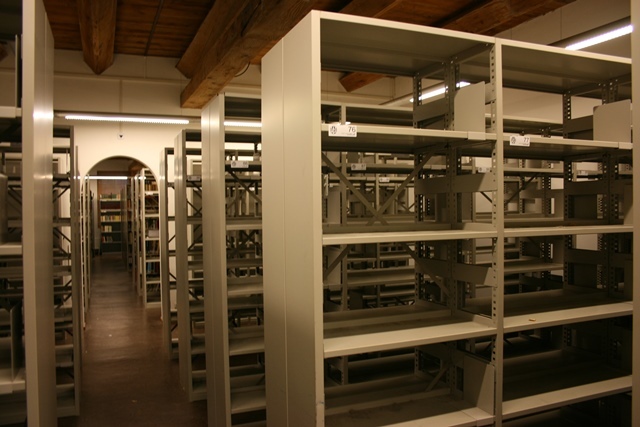 The reference collection will be moved as soon as the new Asian Library is ready for use. 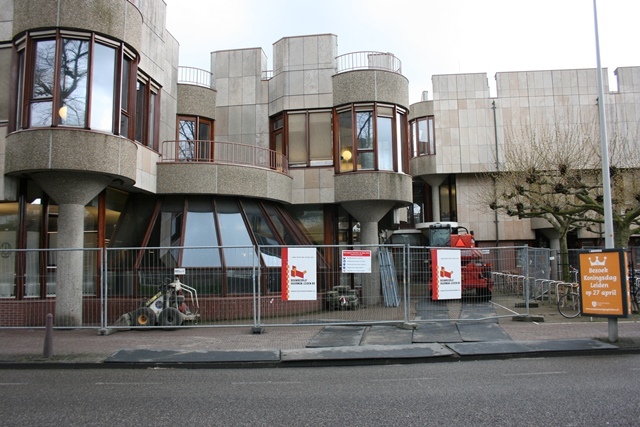 The subject librarians will remain in their offices at the Arsenaal until that date as well. 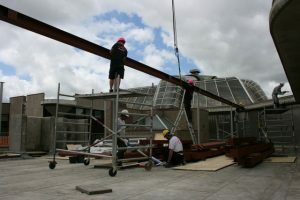 The steel structure for the Asian Library on the roof of the University Library is taking on shape. You can find more information on the work planned in the coming month. On Monday 25 and Wednesday, July 27, the steel roof panels for the construction of the Asian Library will be delivered. A large crane will be set up on the Maliebaan for the lifting operations. The crane will be set up on both days from 06:30 hours in the morning. On these days the Maliebaan will be closed to through traffic. The immediate area, including the houses on the Maliebaan, the parking garage and the University Library loading dock will remain accessible. From Wednesday, July 25 until Wednesday, August 10 the battlements on the roof of the University Library will be shortened on the side of the Witte Singel. The top of the battlements will be cut off and removed by a crane positioned at the front of the University Library. 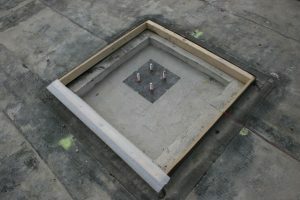 This work will be carried out between 09.00 and 17.00 hours and is not expected to cause much noise. 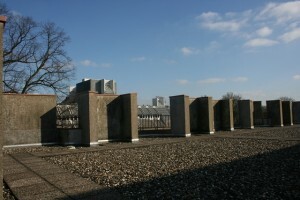 From Monday, July 25 to Friday, August 19 the covering concrete layer on the roof of the University Library will be removed from an area of approximately 1000 square meters. This work is expected to cause severe noise. The work will be carried out between 09:00 and 17:00 hours. Students will be informed about alternative workplaces in the back of the University Library. 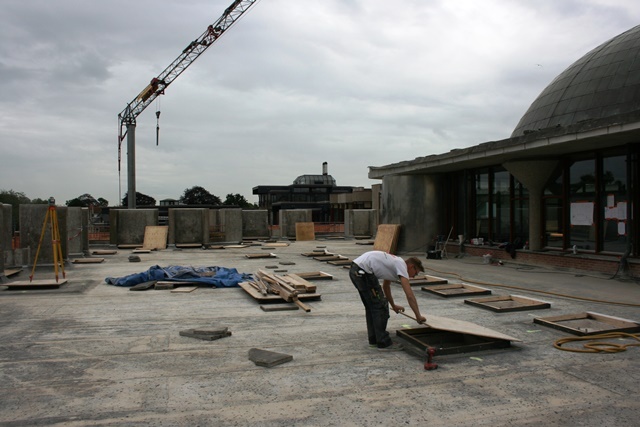 The construction of the Asian Library is now in full swing! 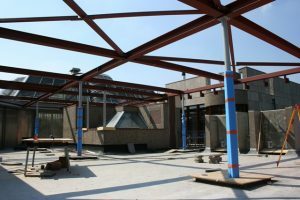 The steel columns for the framework of the Asian Library were lifted onto the roof of the University Library by the large crane. Several columns have already been put into position. 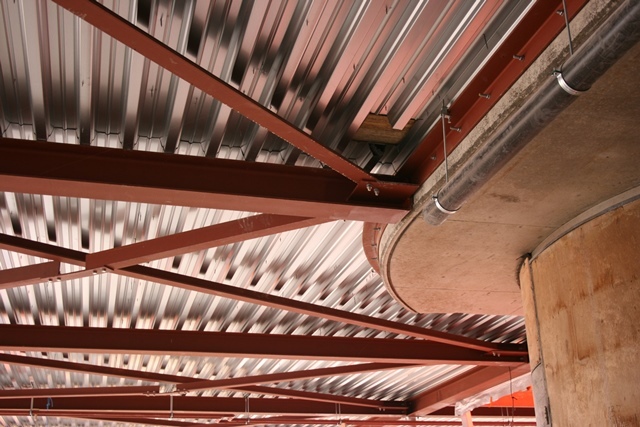 In the coming weeks, the steel framework for the Asian Library will be put together. 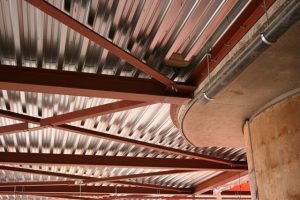 On Monday, July 11 and Wednesday 13 to Friday, July 15 steel columns for the construction of the Asian Library will be lifted onto the roof of the University Library. A large crane will be set up on the Maliebaan at the back of the building. On Monday, July 11 between 06:30 and 09.00 hours and Wednesday, July 13th from 06:30 hours till July 15th, 17.00 hours Maliebaan is not open to through traffic. 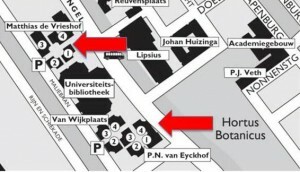 The immediate area such as the houses on Maliebaan, the parking garage and loading dock of the University Library remain accessible. The steel columns will be lifted onto the roof by the large crane and and put into position by the smaller crane placed on the Witte Singel. 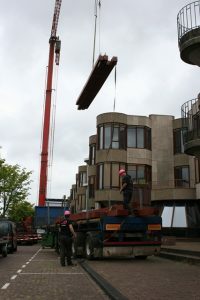 From Wednesday 22th to Monday, June 27th chiselling work will take place on the roof of the University Library for the construction of the Asian Library. Concrete will be removed at the places where the steel columns of the Asian Library will be placed. In total there are 36 locations. The work will be carried out between 06.h00 and 09.h00 in the morning and is expected to cause little inconvenience to staff, visitors and neighbours. 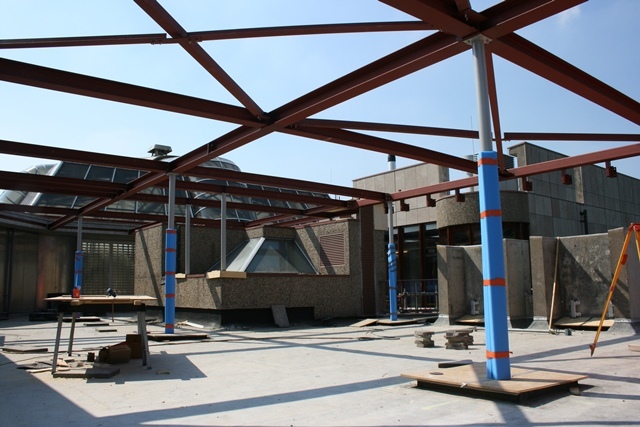 From Monday 6th through Friday June 10th, part of the overhanging concrete roof of the University Library will be removed for the construction of the Asian Library. 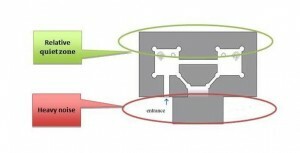 The activities are located in the front part of the building (Witte Singel) and may cause serious inconvenience. Free earplugs are available at the reception of University Library. About 316 alternative study places are available at P.N. Van Eyckhof and M. de Vrieshof. On Tuesday May 31, work starts to remove asbestos-containing sealant from the seams of the battlements on the roof of the University Library. The sealant will be removed by a specialized company. The work will begin at the right side of the building and is expected to last ten days. Yesterday the construction site has been set up and today the building of The Asian Library on top University Library started. 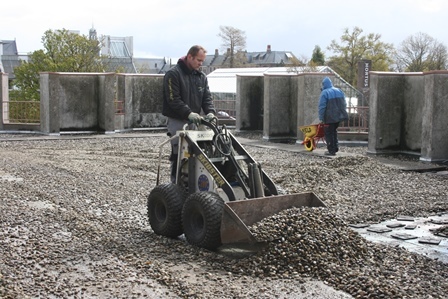 From Tuesday April 27th through Friday, April 29th gravel will be removed from the roof of the University Library via the right side (North) of the University Library (Witte Singel). This may cause some inconvenience. 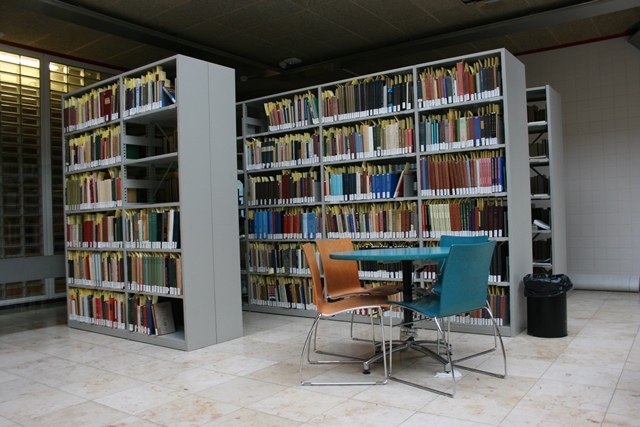 In the second half of May 2015 (weeks 21 and 22), the collections located in the Open Stacks on -1, one floor below the Information Centre Huygens, will be moved due to the renovation and refurbishment of the Open Stacks area. These collections will briefly be unavailable during the move of the collections in these two weeks.